Again thanks to Lisa for capturing the moment so well! The intrepid crew sets out for a day of digging at Eric the Red West, prepared for any sort of weather. Thanks to Lisa for the photo. We didn't exactly pick the best weekend to spend on the exposed south coast of Victoria. The weather forecast was rain and more rain. However, we are a tough bunch and a bit of rain wasn't going to deter us. We rendezvoused at Bimbi Caravan Park, near Cape Otway, (a must for koala lovers) on Friday night and made plans for the next day. Saturday dawned grey but no rain. We were hopeful. We got down to the Eric the Red site - still no rain. The first thing we noticed was the lack of sand, which usually covers most of the shore platform. On this particular morning its absence gave us our first view of the entire fossil layer and its extent. On previous visits to the site, we had glimpsed areas of conglomerate exposed between patches of sand and were unsure of its extent. Now we could see all the layers and we immediately started searching the newly exposed conglomerate for exposed bones. We were rewarded with the discovery of six exposed bones, weathering on the surface of the shore platform - one in the area where the partial dinosaur skeleton was found six years ago and five bones in the newly exposed area. It was a great start to the weekend and we talked excitedly about future work at the site. Then the rain came. It started as a drizzle and built up to a miserable drenching downpour. We toughed it out until lunchtime, but then admitted defeat when it became increasingly difficult to tell the difference between the bones and coal in the conglomerate. Sadly we walked away from our potential bonanza, vowing to return the next day, weather permitting. The afternoon passed slowly, with wistful faces watching the rain fall. However, the rain eased over night and Sunday morning was grey but dry. Back to Eric the Red, where David Pickering wanted to sample a number of sections along the length of the exposure. 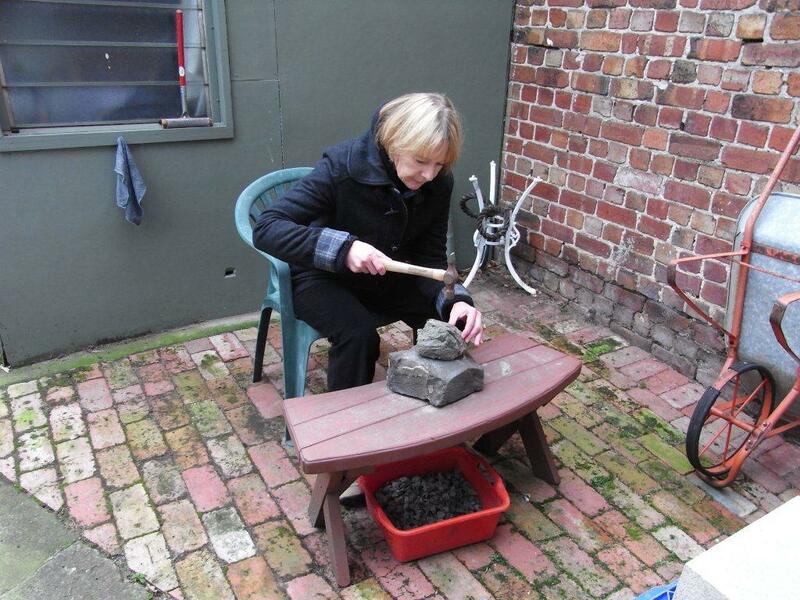 Three areas were chosen and a small amount of rock was collected from each for further processing at Museum Victoria. 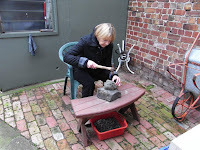 The rest of the crew sat breaking some of the rock that had been excavated the day before, with interesting results. Mary Walters found a nice skull fragment and Gerry Kool found what we are all hoping is a mammal jaw. We will know more after Dave has worked his magic on it in the preparation lab at the Museum. The rain held off and 15 bones in total were discovered - 6 surface bones and 9 bones found during rock processing. A great result for two mornings work. Team photo to follow when Lisa (the official photographer) sends it to us. found by Lesley Kool in the newly exposed area. for the Museum Victoria blog. Mary holding her skully fragment. The sun was almost shining! discovered bones in the background. ﻿A couple of photos taken last Friday when Tony Robinson was filming an episode of his new documentary series at in Dave's lab under the Royal Exhibition Building. 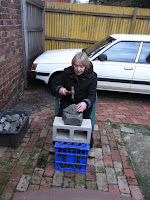 Ursula Smith works at the Museum and was an extra in one of the "Time Team" episodes. 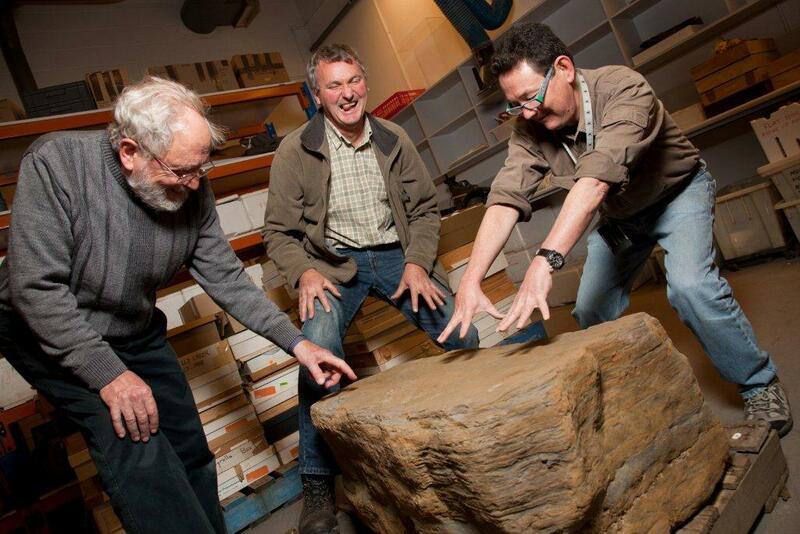 Rolf Schmidt is the Collection Manager of Invertebrate Palaeontology and Dave Pickering (as many of us know) is the Collection Manager of Vertebrate Palaeontology and Palaeobotany. Pip stands beside a tonne of chocolate at the Philip Island chocolate factory. It reminds us of the time that Dr Tom Rich promised the first person to find evidence of a Cretaceous mammal a cubic metre of chocolate. At the time, of course, he did not know that any would be found and so had not actually figured out the procurement of delivery details (for those that don't know the story, Tom persuaded Cadbury later to provide enough chocolate to convince the diggers the debt had been paid). We are informed that the process of making a block of chocolate that big means that the chocolate itself is not particularly nice, but that might just be story to make us feel better about not breaking into it! The 2011 Field Report is starting to take shape. There is now a real good chance that it will be ready in time for October 16th. Current volunteers should be contacted by Lesley in the next few days. 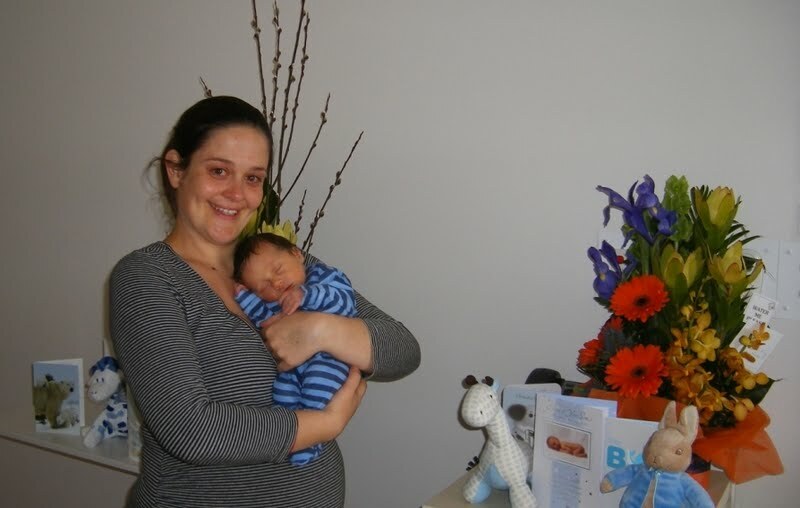 A big welcome to Luca Robert who arrived on August 26th. Our Inverloch dig gets featured in the Bass Coast tourism video. For those of you with really short attention spans, we're about 3 mins into the long video or 1:20 into the short one. Look for Dave in a starring role. We've started to receive a few more submissions for the 2011 Field Report. Dr Tim Holland has written a great article about setting up the Explore-a-saurus exhibit at ScienceWorks that covers such broad topics as dinosaur hands, plumber's pipes and a bloody battle with a T. Rex. To those readers not crew members (or contributors) remember that it's not too late to reserve your copy of the Field Report (and help us fund the 2012 dig) by joining Friends of Dinosaur Dreaming . A number of our mammal jaws recently took a trip to Japan. Over there, Dr Tom Rich used some fancy scanning equipment to image partially prepared mammal jaws from the Victorian Cretaceous. I am starting to hear rumours that the gracile jaw I found and the tiny one that Gerry found are "very interesting". Hopefully Tom will tell us all about it at the Field Report presentation. We're just about ready to lock in Sunday 16th October for this, so crew members and friends should save the date. 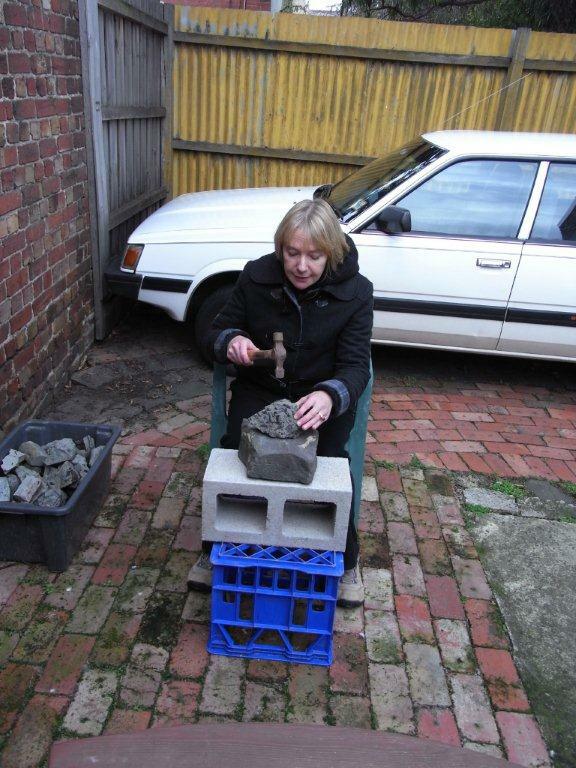 Dave has been trialling new lightweight rock breaking stations for use at the field house next season. Here you can see a couple of prototypes set up in the back yard﻿ at Dave and Sarah's house. Regular diggers should feel free to add any other suggestions as comments - I'll deliver a free fancy coffee to the Flat Rocks site next season to anyone who makes a suggestion that gets incorporated into the new design. at the dig site yesterday - thanks Mike! Remember the digital microscope that Dennis O'Donnell (the Wonthaggi optometrist) donated last year? We’d been finding it a little hard to use since we needed one hand to hold the fossil, one hand to hold the ‘scope, a bit of a jiggle to get it into focus and then quickly use the last remaining hand (or nose) to press the camera button. So I elicited the aid of John and look what he’s built us! We’ll have fun next year taking close-ups of all the teeth we find. Check out the article in today's age. A bone found by Mike Cleeland and George Caspar in 2005 has been identified as a Spinosaur. Check out the article in today's age talking about the footprints that Dr Tom Rich and Dr Tony Martin found on their Great Cretaceous Walk.